Introduction: Biopsy of lymph node tissue helps in the staging of breast cancer, providing reliable prognostic information and identifying patients who will benefit from systemic therapy. Endoscopic techniques combined with liposuction have been developed to provide a minimally invasive technique. 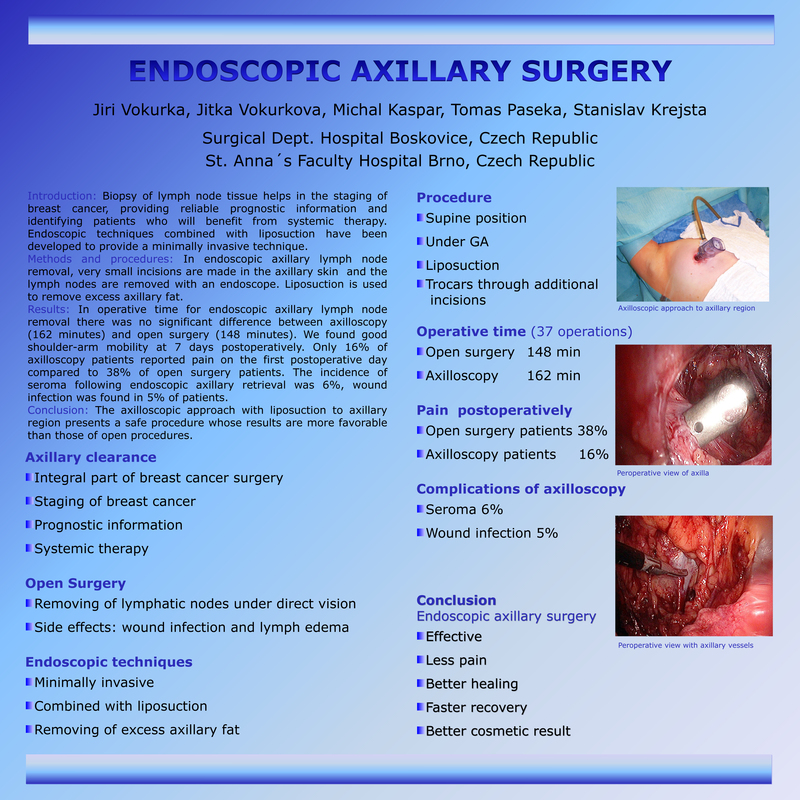 Methods and procedures: In endoscopic axillary lymph node removal, very small incisions are made in the axillary skin and removes the lymph nodes using an endoskope. Liposuction is used to remove excess axillary fat. Results: The operative time for endoscopic axillary lymph node removal found no significant difference in operation time between axilloscopy (162 minutes) and open surgery (148 minutes). We found good shoulder-arm mobility at 7 days postoperatively. Only 16% of axilloscopy patiens reported pain on the first postoperative day compared to 38% of open surgery patiens. The incidence of seroma following endoscopic axillary retrieval was 6%, wound infection in 5% of patiens. Conclusion: The axilloscopic approach with liposuction to axillary region presents a safe procedure whose results are more favourable than those of open procedures.